Impeccable is the word for this distinctive and exclusive Ladder Hair Style. Extremely elegant and graceful, girls with long hair will be going to love this. Follow these simple steps and just with a little effort arrive at special and distinguished look. Step 1: Comb Your Hair to Make Them Smooth and Tangle Free. Gather All Your Hair and Tie Them in a Pony. Step 2: Take a Small Chunk of Hair from One Side of Pony and Braid It Leaving a Small Strand of Hair Before Each Weave at Inner Side Only. Now Take a Chunk of Hair from Other Side of Pony and Start Braiding. Step 3: Add the First Left Out Strand of the Hair from the First Braid into the Middle One and Then Complete One Weave. For Next Weave Again Add the Second Left Out Strand from the Earlier Braid to the Middle Section. Step 4: Continue Doing So Till All the Strands That Are Left Out Are Taken into This Braid. 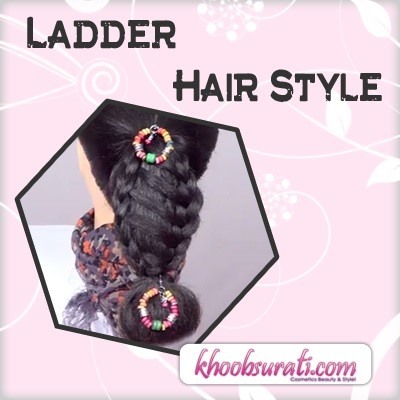 Secure the Braid with a Band at the End and You Will See a Ladder Like Effect Is Formed on the Hair. Step 5: Now Take All the Loose Hair and Pull It Through the Last Step of the Ladder Like Hair. Adorn This Hair Style by Using Hair Accessories as Shown for That Final Look. Hence you saw this cool hairdo is super exclusive and accessible. Just by observing above steps, an awesome new look can be achieved with tremendous ease.